Posted in: Arrests, Media Release. Tagged: Black. A Murfreesboro man has been indicted by a Williamson County Grand Jury after Franklin Police and the Williamson County Sheriff’s Office worked with police in Brentwood, Murfreesboro, and Nashville to solve a string of auto burglaries that plagued area communities last summer. 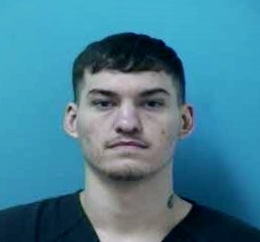 Twenty-one year old Richard Hartman, a convicted felon, has been charged with 13 criminal counts, in Williamson County, that include several auto burglaries and thefts. Hartman has been linked to auto burglaries in the Stream Valley, Fieldstone Farms, and Falcon Creek subdivisions in Franklin. Hartman was linked to the burglaries after Murfreesboro Police identified several items in a Murfreesboro motel room where Hartman had been staying, as belonging to Williamson County victims. Metro Police recovered additional stolen items, linking Hartman to the burglaries, from a Nashville motel room. Hartman is being held in Davidson County. He is due in Williamson County Circuit Court 05/20/2016 at 9:00am.